Formerly a high-ranking military officer, Daryun is demoted from his position in the opening of the anime. 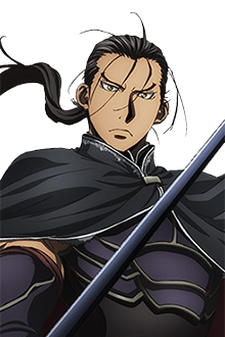 His new mission is to protect and serve Arslan. Daryun and Arslan become close friends. In the style of samurai, Daryun is loyal to a fault, and at point tells Arslan that whatever his true origins may be, Daryun regards him as his prince. His fighting skills are so legendary that, at one point, Prince Rajendra praises him as the greatest warrior in both Pars and Shindra.